As is often the case with popular fairy tales, there’s very little new story to be wrung out of “Beauty and the Beast” these days, so I was a little skeptical of Bryony and Roses. Even after reading T. Kingfisher’s (a pen name of Ursula Vernon) Toad Words and Other Stories, which is full of superb fairy tale reimaginings, I was unsure if there was anything she could do to freshen up such an old and well-worn story path. An opening note that admitted an enormous debt to Robin McKinley, whose Rose Daughter is perhaps the definitive feminist “Beauty and the Beast,” was frankly more concerning than reassuring. I ought not have worried so much. Just like in her earlier fairy tale work, Vernon-as-Kingfisher does an incredible job of exploring and revitalizing ancient material, infusing it with a bright, modern, thoroughly feminist (and unequivocally delightful) sensibility. Bryony and Roses is clearly heavily influenced by Rose Daughter. Let’s get that out of the way, first. However, it’s been nearly twenty years since the release of that book, almost forty years since McKinley’s first “Beauty and the Beast” retelling, Beauty, and close to twenty-five years since the release of Disney’s animated version. There’s also been any number of other retellings of the story, with perhaps a handful of significant new versions in any given year. 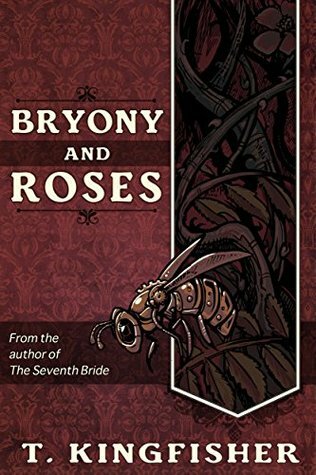 While Bryony and Roses shares some ideas and motifs with Rose Daughter, it also owes a considerable amount to other versions of the story, if in no other way than that it’s very obvious that Ursula Vernon went into writing this tale with a long list of things not to do and a few tropes that she specifically seems to have set out to upend. The first major change Vernon makes to the traditional tale is killing off Bryony’s father before her story even begins, which starts our heroine off with a baseline level of agency that amounts to being basically completely responsible for and in charge of her own life. It’s Bryony herself who gets lost in the woods during a snowstorm, finds herself in an enchanted house, and ends up stuck there through a chain of events involving a rose. Even her agreement to stay at the house is hammered out in a remarkably civil fashion. It seems almost disingenuous to call her a prisoner when she mostly chose to stay of her own free will, largely because she was intrigued by the place and felt that the Beast might be in need of help. While she does have sisters, they too are allowed to be largely independent agents; Bryony worries about them because she cares about them, not because she’s their keeper. We don’t really get to meet Iris, who gets herself safely married soon after Bryony goes to stay with the Beast, but I loved Bryony’s relationship with her sister Holly, who is wonderful. It’s a sister relationship that is drawn with deft sensitivity and humor, and we can see how different these two are but also why they love and need each other so much. I especially appreciate that Vernon doesn’t vilify Iris in order to elevate Bryony and Holly. Rather, their familial dynamic feels real and lived in and is much what I would expect to find in a family of women in a medieval-ish village. It’s also worth pointing out that while the sisters are certainly poor, Vernon has given them a level of rustic self-sufficiency that is consistent with their relative poverty but keeps them from ever being objects of pity. They don’t feel particularly sorry for themselves, so the reader doesn’t have to, either. Instead, we can simply enjoy them as compelling and powerful characters who are more than capable of taking care of themselves and driving their own stories. These are women who have choices and options, albeit limited ones, and they make up for their lack of finances by relying on their individual talents and will to thrive. Bryony herself falls squarely in the category of heroines that are usually described as “plucky.” I’ve never loved the often gendered and condescending connotations of that term, but I do like it for Bryony. She’s so much more than that, though. Bryony is funny, smart, determined, and kind. She’s a sort of cynical romantic who hopes for the best and isn’t afraid to dream, but who always seems to have her feet firmly planted on the ground. Most importantly, she’s her own best advocate and genre-savvy enough to recognize the kind of story she’s in and make the most of it. Where many modern “Beauty” characters are bookish and reserved, Bryony is intrepid and outdoorsy and proves to be a gregarious and charismatic young woman who is also open-minded enough to befriend her Beast right off. The Beast in Bryony and Roses is likewise a different Beast than the one who ordinarily appears in these stories. He’s certainly a flawed character, but without the abusive tendencies of other Beasts. Instead, he’s a rather melancholy fellow, dealing with the effects of a fairy lover’s ill-advised curse, which he can’t even talk about. I love that he’s never a fearsome presence for Bryony, and this allows their relationship to grow organically from basic camaraderie into friendship and then blossom into love. This might be the first “Beauty and the Beast” story I’ve read where I don’t feel as if the romance requires apologetics to justify its existence. Bryony and her Beast are well-matched, and their story makes perfectly good sense. While the Beast himself is not at all scary, as is ordinary, Vernon still manages to develop some horror elements that successfully raise the stakes for her characters. This is well in the spirit of the original story, which definitely had some darkness to it, but it’s a clever modernizing decision to create an antagonist who is entirely new to the tale and external to the original story. It allows a different perspective on several events, redeems the “malevolent fairy” who is the story’s ultimate catalyst, and allows for a far deeper and more satisfying resolution than we normally get in this sort of story. Vernon does a great job overall of playing with fairy tale conventions in her work, and it’s fascinating to examine which traditional elements she keeps and which she discards in each story she writes. Bryony and Roses retains a rather surprising number of “Beauty and the Beast” hallmarks considering how effectively feminist it is. Even some of the fairy tale’s more troublesome aspects are put to good use here, and Vernon’s skill elevates this iteration of “Beauty and the Beast” from being a run of the mill retelling of a classic to being a masterpiece of postmodern criticism with a great deal to say about a good fifty or so years of previous “Beauty and the Beast” stories.